Look, I know that Amsterdam has a reputation for easy access to certain things. I also know as well as you do that college students going to Amsterdam on a travel break are pretty transparent in their motivations. What you may not know, though, is that there actually is a whole other city outside of the Red Light District! And the city is beautiful, charming, friendly and cozy! Sit down if you're feeling faint, I know it can be a bit shocking. Possibly my biggest regret of my travel break is that I did not spend more time in the real city of Amsterdam, instead opting to sit in coffee shops and along the canals. However, I did work in one solid, packed day of sightseeing, which was great. After starting off a little later than expected, a friend and I went to the Anne Frank Huis on Prinsengracht. Magically, we beat the lines, paid our €8.50, and started climbing the leg breaking stairs. I wish that I could say that the Anne Frank Huis totally enhanced my perspective on the book, or was really touching. It wasn't. It is a place to say you have been, worth maybe €3 and a few pictures. 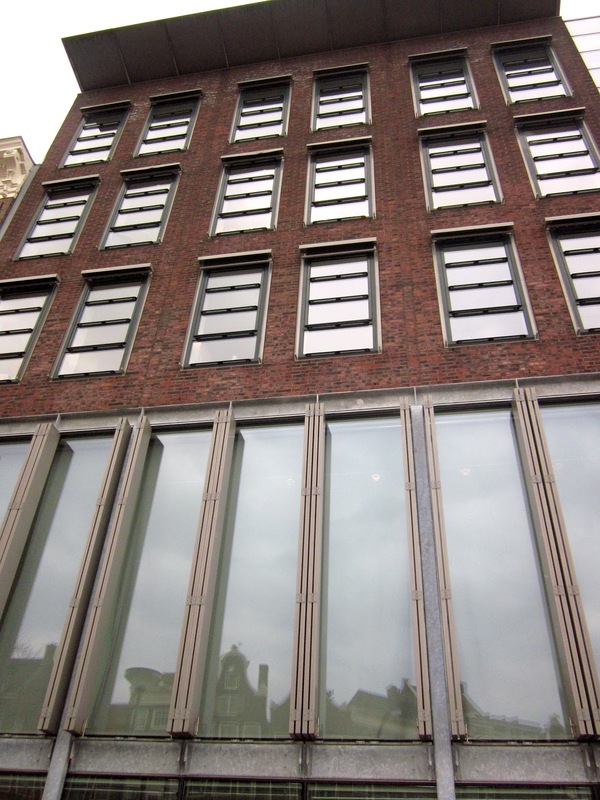 As is, pictures are not allowed and Otto Frank never wanted furniture placed in the house - it is therefore very hard to actually picture how the Franks lived when they were in hiding. Enter The Pancake Bakery, established in 1973. With a three page, double columned, 18" long menu, baby, you've got options. The Bakery is famous for it's "international pancakes," 18 sweet or savory pancakes with ingredients taken from the country that inspired the recipe. For example, a Greek Pancake is filled with lamb gyros, tzatziki and a feta/olive salad, and a French Pancake has apple, raisins, vanilla ice cream, Cointreau and whipped cream. These are not your Mama's pancakes (but Hi Mom, yours will always be my favorite). I had a banana Nutella pancake, but I was with people who had the apple and cheese, the Egyptian and the Belgian. 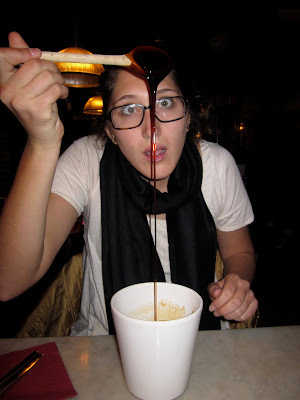 Another cool part of the restaurant is that they put big pots of syrup on each table so you can heap on as much as you want. The syrup was a cross between molasses and caramelized simple syrup. Super fun to play with, as you can see. Refueled and refreshed, we started the trek over the to Van Gogh Museum. Again, there are no pictures allowed - really cramping my style! - but trust me when I say that it was SO worth the time and money. The permanent collection possesses more than 200 of Vincent Van Gogh's paintings, 500 of his drawings and more than 750 letters. Also on display were some of Paul Gauguin's works. To wrap up the day, we went to the Heineken Brewery. I do not want to say too much now, because I have plans for a future compare/contrast post about some of the breweries I have visited while being in Europe. Suffice it to say: Heineken put a lot of money into creating a multimedia-focused, advertisement-laden museum/brewery. I thoroughly enjoyed my time exploring the city of Amsterdam, and if I could go back, would see even more museums and real neighborhoods. And eat more pancakes.